Trying to follow the Greek financial crisis is a bit like watching a piece of surrealist theatre. You struggle to understand what your eyes are seeing. Greece is the weakest of the European economies, but this was the case in 2002 when it dumped the drachma, and became part of Euroland (or the Eurozone as it likes to be called). Economists knew then that Greece did not fully fit entry requirements, so the decision was a political one, rather than an economic one. Joining Euroland meant that Greece had access to borrowing, that was previously denied it. It took advantage, and went on a spending spree. Public spending soared, and public sector wages practically doubled over the last ten years. Expenditure greatly exceeded income, and it needed to borrow money to fill in the gap. It became too expensive to borrow money commercially, so they turned to the European Union and the International Monetary Fund for a 'bailout'. The Irish Republic and Portugal had already received bailouts, and in May 2010, it was given a bailout loan of 110 billion euros. It is now looking for a further 109 billion euros to pay its bills, and the European Commission (EC), the European Central Bank (ECB) and the International Monetary Fund (IMF) will meet in Athens tomorrow to review the situation. It seems likely that a further bailout will be forthcoming. 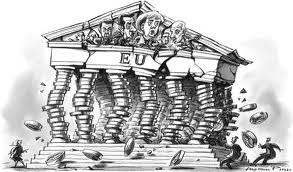 The aim of the bailouts is to shore up Greece's economy, calm the financial markets, and stop the problem spreading to other debt-laden European economies. It is also being driven politically by Germany and France to ensure that the "European dream" does not fall apart. Of the 17 countries who adopted the euro as its currency, 5 are in severe problems over debt - Greece owes about 340 billion euros; Ireland is forecast to owe about 173 billion euros by the end of 2011; Spain owes about 630 billion euros; Portugal I can't work out, and Italy has a massive 1.9 trillion euros of total debt. It may be of interest to note, that while the UK is not part of Euroland, its debt at the moment is around £940 billion. Economists like to talk in complicated language about the debt crisis, and the reasons for it. Some see a reason for inadequate income generation as "rampant tax evasion", with the Greek labour minister estimating that a quarter of the economy pays nothing. While you have to condemn tax evasion, surely the fault must also lie with the Government's inability to collect taxes. I think though that the problem is much more corrupt. Greece was never going to be able to pay its debts, and it knew it. The IMF and the ECB knew that Greece was never going to pay its debts, but it still gave out loans, to try and keep Euroland alive. This is all so dishonest, reprehensible and irresponsible. You don't have to be an economist to know that if I spend more money that I get in, I'm in trouble, and no-one will bail me out. If I take out a loan knowing that I won't have the means to pay it back, makes me guilty of fraud, and no-one will bail me out. Governments however can do it, and ask to be bailed out. Many observers in the financial markets see it as inevitable that Greece will default on its debts, and when this happens, the same will be true of Ireland and Portugal. The only question being discussed in some quarters is to whether the default will be "orderly" or "disorderly". This is econospeak. An orderly default means that a substantial part of the debt is rescheduled so that repayments are pushed back decades. Euroland leaders are proposing a 50% write-off of money loaned by private lenders, which they describe as a "haircut". A disorderly default would mean that much of this debt is not repaid - ever. The fear is that whichever default takes place, other countries such as Ireland and Portugal will follow suit, and the effect will be felt across Europe, as well as further afield. Some may be asking, what has all this to do with us? So what if Euroland collapses; we're not part of it, and if the IMF etc want to go on propping up failing economies, let them get on with it. If only we could distance ourselves from all of this so easily. But we can't. Did you know that the UK has already handed over £12.5 billion in emergency loans to Greece, Ireland and Portugal to help prop up the euro? Why has it done this with our money? The simple reason is to avoid losing more money. The chart above shows the countries that are most exposed to Greek debt. France is the greatest with a total of 56.7 billion dollars at stake. The UK has a debt exposure of 14.6 billion dollars. If Portugal defaults on its debts, the UK banking sector is exposed to the tune of £29.5 billion, and the largest foreign lenders in Ireland are UK banks. If UK banks end up losing out, what do you think will happen? Yes, an appeal to the Government for their own bailout, and who pays for this? The UK taxpayer. Even if none of this happens, the crisis is going to cost us a lot of money. Christine Lagarde, IMF managing director says that the current £250 billion 'war chest' was insufficient, and "pales in comparison with the potential needs of vulnerable countries, and needs to be expanded to deal with the worst-case scenarios". A new target fund of £2.6 trillion has been proposed, which, because of the agreement with the IMF that the UK has signed up to, will mean that the UK is liable for 4.5% of this, around £115 billion contributed to an enlarged bailout fund. This is the equivalent of £4,600 per household. Enough about money. Enough about countries. Enough about the IMF and other financial institutions. 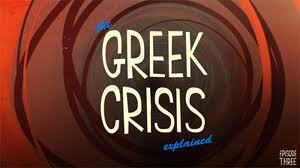 The real Greek tragedy is what is happening to its 11 million of a population. To get financial aid, the Greek Government is forced by the ECB/IMF to institute what is known as "austerity measures". These are bad, with worse to come. Through strikes and marches, the Greek people are saying that they've had enough, and that they're running out of patience with the austerity drive that is ruining their lives. They are enduring wages cuts, benefits cuts, pension cuts, and rising unemployment. The graph opposite shows that since about April 2009, unemployment has risen from just over 8% to it present level of 16.2% (42% for youth unemployment). It is said that 1,000 jobs a day are being lost. The wages for 30,000 public sector workers will be cut by one fifth, and pensions for all by 10%. In actual fact, pensions paid to those younger than 55 will be shaved by 40% for the amount exceeding 1,000 euros a month. In addition, crime, homelessness, emigration and personal bankruptcies are on the rise. According to Marcus Walker of The Wall Street Journal, "The most dramatic sign of Greece's pain, is a surge in suicides". About 40% more Greeks killed themselves in the first five months of this year than in the same period last year. The suicide help line, Klimaka used to get four to ten calls a day, but "now there are days when we have up to 100". This is in a country with a strong stigma attached to suicide. The Greek Orthodox Church forbids funeral services for suicides unless the deceased was mentally ill. Because of this, families often mask suicide deaths as accidents. Click here to read the heart-wrenching story of Vaggelis Petrakis. 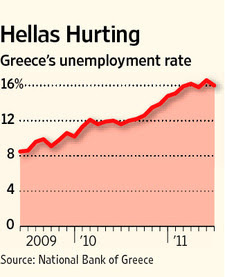 Here as I say is the real Greek tragedy; what is happening to its people under the guise of austerity measures. What is happening there, can happen anywhere. The cruelest toll being exacted in this crisis is the death of decent, hard working, dignified people, and the humiliation of so many more. The European dream destroys democracy, destroys countries and destroys people. What happened to independence and individual country responsibility? Why can't we support each other without formal alliances? Where is the incentive to be prudent and frugal, when you know that there is a bailout around the corner for profligacy? In a recent poll, 80% of Greek people said that they refused to make any more sacrifices to get EU/IMF aid. I can understand where they are coming from. Never forget the real Greek tragedy. What of the politicians? Let me finish with a comment from CNN in America. "It is still possible that the Europeans can come to grips with this crisis before we end up in a replay of Lehman Brothers, but in a depressing replay of 2008, for now it seems, that the flavour of the day is wishful thinking".